The GAA National Club Draw which took place in Páirc an Chrócaigh on the 8th of March 2018 and was presided over by John Horan, Uachtarán Cumann Lúthchleas Gael and independently observed by Brian Cormack, Audit, Assurance Director, Mazars. Thank you to all those who sold and purchased tickets and supporting our Club at the same time in this draw. Your support is much appreciated. Unfortunately we had no winners in the draw but the Club are winners in that all monies raised by our ticket sales stays with our Club. Tom Power of Sliabh gCua St. Marys GAA – Waterford. Ulster–Sean MacCumhaills, Donegal and Naomh Mhuire Convoy, Donegal have both sold the maximum of 2,000 tickets. This is a Draw for all Clubs who sell, record and account for a minimum of 200 tickets. 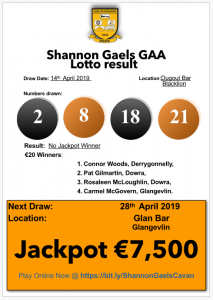 Club Lotto Result Update Draw March 4th, 2018.